Home › Christian Living › Where Are The Gauges? On my way to the building today, a little yellow light in the shape of a gas pump caught my eye. 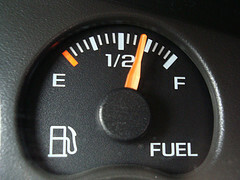 I had not looked at the gas gauge in a while and was very low on gas. Because of this bit of intervention by my car, I was able to immediately stop for fuel and avoid the embarrassment and hassle of running out of gas. It would be great if we had spiritual gauges to warn us of dangerous behaviors or conditions so we could make timely and necessary adjustments. If our frustration and anger were growing, a red light warning us to calm down would be nice. If we are about to say anything unkind, gossip, or lie, a warning alarm could bring us to our senses and cause us to reign in our speech. In fact, we do have some gauges. Our conscience and our Bible will help us detect things that are wrong in our lives or things that we should add so we can make adjustments. A conscience trained in the word of God will detect when we are not doing as we ought or urge us to do something God has commanded. Sometimes we ignore the warning signal. Cindie and I used to have a van in which the “Check Engine” light would say on. Usually this is an ominous warning but a mechanic, after checking the codes, assured us that the warning light was the only problem. It would cause some concern with those who rode with us, but we assured them that things were ok. Of course, if some real danger developed, how would we know? I was only concerned when one day, the light <em>stopped</em> coming on (the light bulb finally died). We can ignore the appeal of our conscience to change our behavior. We may be troubled when we do (or fail to do) some action. Our conscience tugs at us and reminds us to conform our will to God’s law. If ignored, the message of the conscience, like our warning light, will not have much impact and will finally turn off. One day, Cindie and I visited the Motorsports Hall of Fame at the Talladega Superspeedway. In the museum, there were cars from all eras of stock car racing. In the modern stock cars there was a plaque saying that the gauges are usually positioned in such a way that at the optimal speed and performance, all of the gauges would point up. When traveling at speeds nearing 200 MPH one does not want to take his eyes off the road for long. Among the gauges I noticed three that are important to our cars that were missing from the race cars: the speedometer, odometer, and gas gauge. It quickly dawned on me why the speedometer was unnecessary. If there are more cars passing you than you are passing, you are going too slowly. If you are leading the cars, you are going fast enough. As Christians, we do not need a speedometer. We gauge our progress by honestly asking, “Am I really doing all that I need to do and what God expects of me?” In our language and actions, we should be doing better than the ungodly world. If are lives are constantly shamed by those who are not Christians, we need to improve quickly. Jesus preached that “unless your righteousness exceeds the righteousness of the scribes and the Pharisees, you will by no means enter the kingdom of heaven” (Matthew 5:20). Christ set a pace for us by living a perfect life. We will not be able to run as perfect a race as He did but we can run better every day and improve over yesterday. We can look at His example, surrounded by a great crowd of witnesses, and run with endurance the race that is set before us.” We do not need an odometer, because we must run full strength until we die and cross the finish line. We do not have a gas gauge. We do not know when our time will run out therefore we must run with diligence today and not plan our best efforts for some tomorrow; tomorrow may never come. We must account for how we have used the time we have been given. Unlike the racecar drivers, we do not know when the race will be over.